During the past couple of days OYAMA IKF was enriched by OYAMA Karate School in Kurunegala in Sri Lanca, with Sensei Kithsiri Kumaranayake 1st dan. Currently the club in Central Sri Lanca has around 50 students. For many years club existed as Kyokushinkai-kan Karate. Though out the existence of the club over 5000 students passed trough its gates and now many of them compete and have a lot of success in Sri Lanca. 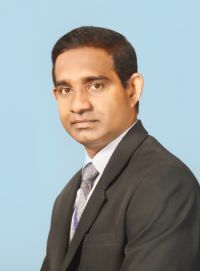 Sensei Kithsiri Kumaranayake 1st Dan, was born in 1966. He is a son of teachers and has 5 siblings. He began his training in 1979 in Kyokushinkai-kan Karate Dojo. As a fighter he competed between 1981-1996. In 1983 he competed in first Sri Lanka Full Contact Open Karate Tournament and was its youngest participant. During this tournament Sosai Masutatsu Oyama performed the duties of a head referee. 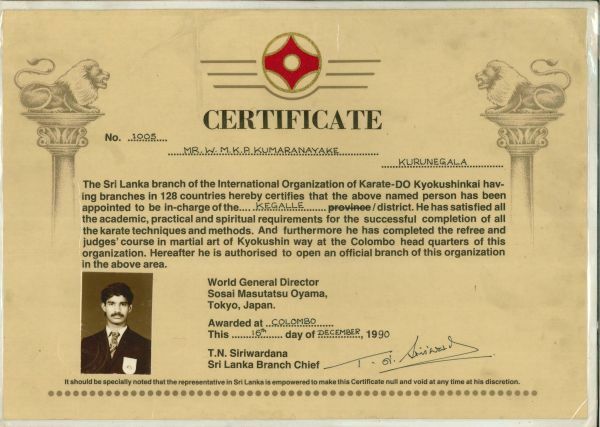 In 1990 Sensei Kumaranayake was nominated head Kyokushinkai-kan instructor of the Kegalle region in Sri Lanca. Nine years later he became head Sensei of the northern, western and central part of Sri Lanca. In 1997 Sensei was promoted to 1st dan. From this year forth he also worked as a side referee. 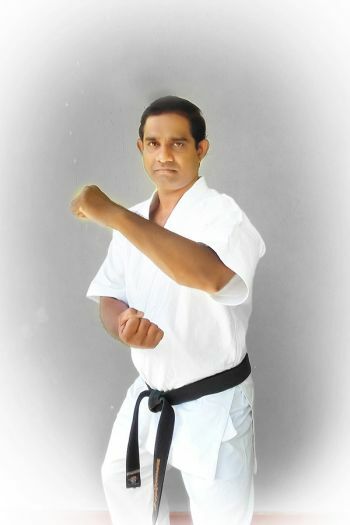 Sensei Kithsiri Kumaranayake was the oldest Kyokushinkai-kan karate instructor in Sri Lanca with a record of 35 years spent in this organization. TRUST AND THE DECISION TO JOIN OYAMA IKF. WELCOME TO OUR ORGANIZATION, OSU! WE WISH YOU FRUITFUL COOPERATION AND ALL THE SUCCESS BOTH LOCALLY AND INTERNATIONALLY. OSU!